Our list of reasons to vote for Stadium of the Year 2016 is now on its 2nd position. We move to Austria and the Allianz Stadion in Vienna. 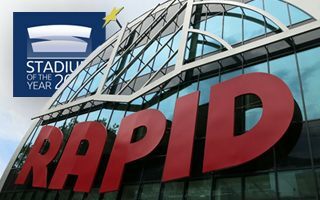 Sure, to many supporters it’s not Allianz at all, rather Weststadion, but Rapid had to get a naming rights deal in order to foot the bill for their largest ever project. That bill, while huge in terms of investment, is really good value for money. Rapid’s private stadium cost over €50 million, which – including Austrian labour prices – is really cost-effective for a 28,000+ stadium. Sure, this number includes massive 11,300 standing places (which many fans simply love), but it’s convertible to a 24,000-all-seater for European games. It was also built really fast. In January 2015 Strabag were pouring first foundations and 12 months later green and light blue polycarbonate roof sheets were being laid. Thanks to this stadium Rapid are now above 21,000 fans per game now, which means that every third ticket bought in the Austrian Bundesliga is bought at this very stadium. Benefits don’t stop here, because 10% of the capacity are business seats and the western main stand also offers extensive (quite frankly, unmatched in Austria!) corporate facilities for everyday use. It’s also soaked with club identity, with big credit for Rapid’s faithful fans given. No wonder, after all they co-financed the stadium in Austria’s largest crowdfunding campaign. In return they received a stadium in green, white, blue and red colours, with a massive club crest incorporated in the design and with a floodlight mast of the old Hanappi-Stadion, currently serving as historic landmark. Of course it’s up to you if you decide to support Allianz Stadion in the competition, but we feel it’s got a lot going for it!